Students had the opportunity to voice their thoughts on the College’s recent move to address sexual harassment and abuse of power on campus. On Jan. 11, Student Assembly and the Student and Presidential Committee for Sexual Assault co-hosted an open forum about the Campus Climate and Culture Initiative — the College’s new initiative to combat sexual violence. 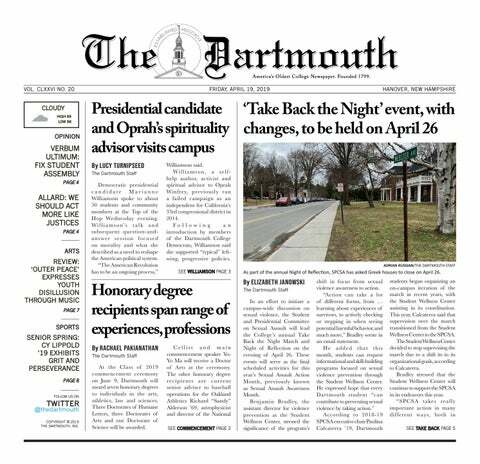 The initiative, which was announced by College President Phil Hanlon on Jan. 3, follows the filing of a $70 million lawsuit against the College alleging that Dartmouth violated Title IX and failed to protect the plaintiffs from sexual harassment. SA president Monik Walters ’19, SA vice president Nicole Knape ’19, SA ambassador of student life Carlos Polanco ’21 and SPCSA executive chair Paulina Calcaterra ’19 facilitated the forum in Collis 101, which saw about 20 attendees over the course of an hour and a half discussion. Representatives from SA and SPCSA said that the purpose of the event was to field student opinions about the initiative in an open setting and report those sentiments to the administration. The College does not currently have an official representative for the initiative, they said, but is in the process of finding one. Senior associate dean of student affairs Liz Agosto ’01 was the only administrator present for the entire duration of the meeting. Student Wellness Center associate director Amanda Childress arrived later in the forum. Polanco opened the forum with a short presentation outlining the initiative and its components. The initiative features reforms largely inspired by a 2018 report published by the National Academies of Science, Engineering and Medicine. These reforms include mandatory Title IX training for faculty and staff and an evaluation of the College by an independent external advisory committee. The timeline for implementing the proposed reforms also concerned several students present at the forum. One expressed frustration with the College’s commitment to hiring five new counselors in a three- to four-year time frame, despite the immediate need, and the one- to two-week long wait times for students currently seeking counseling on campus. In response, Walters referenced a conversation she said she had with interim dean of the College Kathryn Lively, who cited financial concerns and difficulties in acquiring and retaining mental health professionals. Agosto also noted the shortage of mental health professionals in the Upper Valley as another cause for delay. Other issues brought up at the forum included students’ doubts about the College’s transparency in releasing department evaluations and reports as mandated by the initiative. Students also voiced concerns regarding the efficacy of using online modules for faculty and staff training. Diana Vizza ’20 said she attended the forum because she wanted to add her voice to the discussion about sexual violence on campus. Calcaterra added in a later interview with The Dartmouth that she felt the discussion at the forum was constructive and informative. According to Polanco, SA is planning on holding more open forums in the future.